Cricket is an extremely important aspect of India. The tense moments of the match unite us all, no matter what background, what religion, what gender! One name in the cricketing industry that is almost as famous as the sport itself, is probably Sachin Tendulkar. 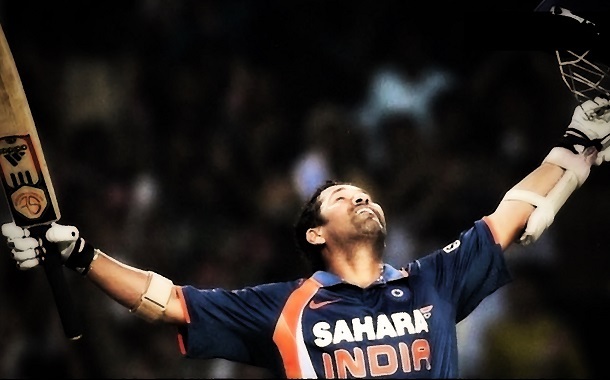 As this Master Blaster turns 42 on this 24th of April, we thought we’d list out 42 interesting facts about Sachin, (after all he is our brand ambassador) some known, some lesser known and some (we hope) unknown. 1. Sachin is ambidextrous, he uses his left hand to eat and write, while the right hand is used to bat and bowl. 2. We all know Sachin is a brand master, but the first brand he ever endorsed was Band-Aid, as a teenager. 3. 14-year-old Sachin, was a ball boy, (a boy who retrieves and supplies the game balls for players) during the 1987 world cup held in India. 4. Sachin’s debut test match was Kapil Dev’s 100th test match. 5. Sachin joined twitter in 2010 and by 2011 had a million followers. He became the only Indian in the million-followers club. 6. He met his wife Anjali at the Mumbai airport, while returning from an England’s tour in 1990. 7. Sachin Tendulkar and Vinod Kambli shared a 664 run partnership during a test match and thus have two wards in Tihar Jail named after them. 8. In 2007, during the Lord’s test, Harry Potter, or more suitably, the actor Daniel Radcliffe queued up for Sachin’s autograph. 9. In the team bus, Sachin always sits on the left window seat of the front row, talk about sports superstitions! 11. He is also an actor and made an appearance in the 2003 Bollywood movie ‘Stumped’. 12. Don’t be fooled by his small stature, Sachin is extremely strong and uses a bat weighing 3.2lbs. 13. He is the only Indian cricketer to share space with many celebrities at the Madame Tussauds wax museum. 14. Richard Branson’s Virgin Comics is set to feature Sachin Tendulkar as the superhero Master Blaster. 15. Sachin was the first to reach the mark of 30,000 international runs. That’s a lot of running! 16. On his debut match, Sachin wore a set of cricket pads gifted to him by Sunil Gavaskar. 17. Sachin Tendulkar holds as many as 19 world records in the Guinness Books of World Records. 18. The CCI (Cricket Club of India) amended its rules so that the 14-year-old Sachin could use their dressing room. 19. In his first ever match, Sachin got out at the first ball, scoring a zero. Greatness isn’t achieved overnight, its a gradual process. 20. Future Group launched a toothpaste named after Sachin called Sach. 22. Sachin visited Madame Tussauds wax museum in 1988, twenty years before he was commemorated in the same museum. 23. The only test playing nation where Sachin has NOT scored a test century is Zimbabwe. 24. Sachin has been honoured with both, the Padma Vibhushan and the Padma Shri, the second and the fourth highest civilian honours respectively. 25. Sachin was inducted in the Laureus Sports Academy recently and the event was hosted by none other than Benedict Cumberbatch. 26. Mick Jagger, a founder member of the famous English band ‘The Rolling Stones’, is a fan of Sachin Tendulkar. 27. Sachin’s daughter Sara is named after the Sahara Cup, the first tournament Sachin won as a captain in 1997. 28. Sachin made an appearance in an Australian reality TV show called ‘An Aussie Goes Bolly’, narrated and produced by Hugh Jackman. 29. Sachin Tendulkar’s best bowling in one day international cricket was against Australia on April Fool’s day in 1998. Bet the Australian team wasn’t laughing! 30. He is the first person, with no background in aviation, to be made an Honorary Group Captain, by the Indian Air Force. Why you ask? For his achievements in cricket of course. 31. His coach Ramakant Achrekar gave him 13 coins when he managed to pass an entire session without being dismissed from the nets. These 13 coins, according to Sachin, are his most prized possessions. 32. Sachin is quite the humanitarian and sponsors 200 under privileged children every year through Apnalaya, a Mumbai based NGO. 33. Sachin co-owns the Kerala Blasters Football Club, which lost the finals of the Indian Super League in 2014. 34. His favourite Hollywood movie is the Eddie Murphy comedy film, Coming to America. 35. Sachin has batted for a total of 41,113 minutes in Test Cricket. The only other cricketer to bat longer is Rahul Dravid. No surprises there! 36. He has been involved in 23 run outs. He was out for 9 of those times and his partner on the remaining 14 occasions. 37. Sachin Tendulkar was the first cricketer ever to be declared out by the third umpire, in an international game. All this transpired in the year 1992. 38. During their iconic 664 run partnership match, Sachin and Vinod Kambli kept singing and whistling, so as to avoid eye contact with coach’s assistant who wanted to declare the match, as they were enjoying and wanted to bat on. 39. Sachin is simultaneously both the youngest and the only sportsperson to win the Bharat Ratna, India’s highest civilian award. 40. Sachin is the cricketer to have played the most number of test matches. 42. Sachin has played ODIs (One Day Internationals) on 96 different grounds. That qualifies him as a traveller.